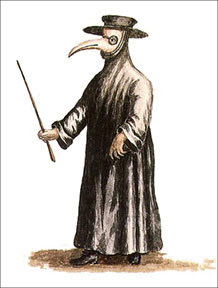 One thing's for certain: whomever I designate as the god of disease will look like this illustration. After long delay, here at last is the my random table of Major Chaotic Traits, to complement the Minor Traits I posted a few weeks ago. 3 Creature can command all normal Shadows within 30 feet. 4 Any creature killed by a creature with this trait rises as a Shadow in 1D6 rounds. Creatures who suffer this fate may not be raised or resurrected. 5 Creature gains the ability to cast dimension door at will. 6 Damage inflicted by the creature cannot be healed magically. 7 Magical attacks heal the creature rather than damage it. 8 Takes maximum damage from any spells cast by creatures aligned with Law. 9 Creature regenerates 1d4 hit points per round. 10 Creature immune to all magical damage, but may be harmed by healing magic, which does damage equal to the amount it would normally have healed. 11 Successfully striking the creature deals 1d6 points to the attacker. 12 Creature becomes partially incorporeal and takes no damage from physical attacks 25% of the time. Erlik, Hanuman, Ishtar, Mitra, Set. Athena, Odin, Seker, Thor, Thoth. Loviatar, Mielikki, Oghma, Silvanus, Tyr. Look at these lists. This is how you build a pantheon for a pulp fantasy setting: by stealing liberally from real world mythologies, warping them into what you want, and then adding details to make them better suit your setting. 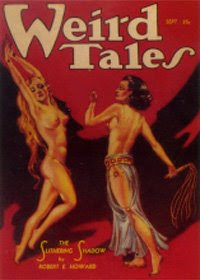 As ever, Robert E. Howard was the trailblazer. The deities of the Hyborian Age were often -- though not always -- based on those from historical cultures, much like the cultures of Hyboria themselves. I mentioned previously that I consider Howard's fictional prehistoric world to be one of the most perfect fantasy settings ever created. Part of it is the way that REH takes names that we either already know (or that sound like ones we already know) and then turns them to serve his own purposes. He gains the benefits of familiarity without any of the drawbacks, in the process creating a setting that manages to transcend pastiche. In my opinion, that's exactly what any good referee wants to do in creating pantheons for his campaign setting. When I was younger, I found this "mix and match" approach to be unsatisfactory. It seemed "unrealistic" to me and I obsessed over trying to come up with what I saw as believable collections of gods. As I've grown older, I've come to embrace the liberating power of incoherence a bit more. I've also realized that, just because I might swipe a name or a concept from real world mythology, that doesn't mean I'm bound by its specifics. Indeed, I should use the real world referents as touchstones for unleashing my own creativity. That's what Howard did and that's what Gygax did. 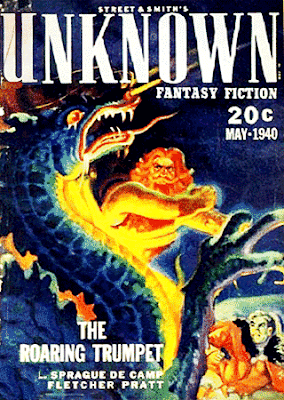 It's a fine pulp fantasy tradition and I think the random goulash of gods stolen from any source not nailed to the floor is one that should be promoted more widely. Over the next few days, I'll try to post some of my notes as I create my own pantheon to show you how and why I've made the choices I make. It's my hope that I can illustrate better some of what I'm talking about here, in addition to creating something that I (and perhaps others) might find useful in their own campaigns. 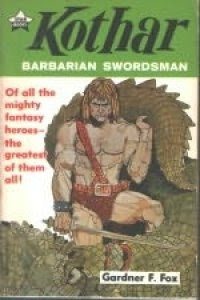 Published in 1969, Barbarian Swordsman is the first book of the Kothar series, written by Gardner F. Fox, best known for his involvement with DC Comics during its Golden and Silver Ages. (According to some, he was responsible for the Green Lantern Oath and the name of Guy Gardner is almost certainly an homage to him). The Kothar stories might be called science fantasy versions of Conan's adventures, taking place on a world called Yarth, which is either a parallel to Earth or indeed Earth many billions of years in the future, when science and magic have become indistinguishable. Astute readers will remember that Yarth has a place in D&D lore, so it's no surprise that Gary Gygax thought highly of the Kothar stories and considered them an influence on the game. In light of the rather unexpected level of response to my post yesterday about the 4e paladin, I realized that I ought to do a post about what I'd have done if I'd have been given total freedom to create a new edition of Dungeons & Dragons. I'm a bit busy at the moment and thus unable to write up a comprehensive post just yet, but I did want to offer up one thing I'd do that strikes me as a no-brainer: bring back the Basic and Advanced "brand names." One of the oddities about D&D naming conventions is that AD&D was created when there was no Basic D&D. Neither OD&D nor the Holmes edition call themselves "Basic." By the time that there was a true Basic D&D, AD&D had been out for several years and the two games, though related, were no longer designed or marketed as being on the same "continuum." There was a family resemblance between the two games, sure, but there was never any formal connection between them, at least as far as TSR was concerned. As far as the fans were concerned, though, Basic and AD&D were two sources of ideas and adventures and most people who entered the hobby during the period between 1979 and 1984 tended to make little distinction between them. Indeed, I've still never been given a satisfactory answer to exactly why TSR bothered to maintain two separate lines, given the large amount of crossover between the buyers of both. 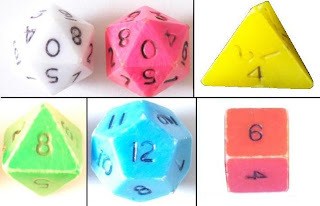 In the crazy world where I was given total control over D&D, there'd be a Basic D&D game covering levels 1-5 (or thereabouts) that'd come in a box and sell for under $20 in game and toy stores. It'd be aimed at children ages 10 and up (or thereabouts) and would focus primarily on dungeon adventuring. Advanced D&D would be aimed at older kids (14+) and would follow the traditional three-book model. The important part of this plan is that the rules of both Basic and Advanced would be the same, with Basic necessarily being, well, more basic in terms of complexity and presentation, but they'd still be completely compatible with one another. This approach would necessarily mean that the rules would have to be far simpler than either WotC edition, but that's a good thing in my book. The icing on the cake would be that both versions of the game would be one-shots. That is, there's the boxed set and there are the three books, but that'd be it. There would certainly be adventures and possibly miniatures, but there'd be no supplements or additional rules beyond whatever fans or third parties produced (I'd make the game almost completely open BTW). Every few years, there might be new "editions" with new art and errata integrated into the text, but nothing in the way of changes to the way the game plays, because it's important that when a kid finds his Dad's old copy of the game, he can still play it with his friend who got a shiny new copy for his birthday. That's the way to ensure that the hobby survives and prospers from one generation to the next. But this is all a pipe dream and further evidence of why I'll never be put in charge of D&D. If you approach comics as a poor relation to film, you are left with a movie that does not move, has no soundtrack and lacks the benefit of having a recognizable movie star in the lead role. That's from a recent interview with Moore, where he talks about his distaste for the upcoming film version of his Watchmen comic. Reading it, I heard echoes of things I myself have said about the RPG hobby and the way it's been deformed by the demands of trying to turn it into a mass market product with mass market profits. I (obviously) don't agree with everything he says, nor do I think his perspective has universal applicability to this hobby, but some of it does and it's worth reading, if only to realize there are some people out there even more strident than I am when it comes to protecting something they love. The Holmes Basic Set I owned came with module B1 In Search of the Unknown by Mike Carr, better known as the creator of Fight in the Skies (aka Dawn Patrol). If I had to choose the one module that had the greatest effect on me as a referee, it's this module, hands down. 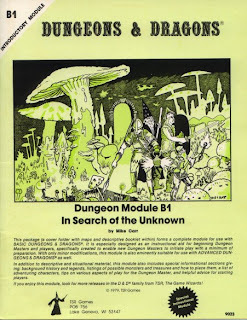 The reason is quite simple: B1 was written specifically as an "instructional aid for beginning Dungeon Masters" and so it was. I learned a number of really important lessons from using this module -- and use it I did -- chief among them being this: rooms containing pools of unknown liquids are cool. More seriously, B1 really was an excellent "instructional aid." What it gave you was a two-level dungeon already mapped out for you, along with descriptions of most of the rooms, such as the aforementioned "room of pools." The module also provides a thin backstory about a pair of possibly evil adventurers named Rogahn the Fearless and Zelligar the Unknown who used their orc slaves to construct a fortress they called Quasqueton (presumably because Mike Carr is a fan of Frank Lloyd Wright). They then disappeared while fighting barbarians in the frozen north, leaving behind their fortress and its dungeons for other presumably non-evil adventurers to plunder. The real genius of the module, though, is that, although each room has a description, none of them contains any monsters or treasures. It's entirely up to the referee, using the D&D rules and assisted by some tables at the back of the module to place monsters and treasures throughout the place. This might seem like a small thing -- and it is -- but the salutary effect it had on me was remarkable. 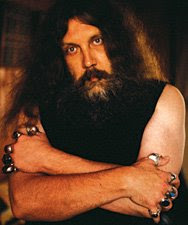 Mike Carr had done all the hard work by designing the maps and describing the rooms, but he left it to each referee to populate the dungeon as they saw fit. From the start, I felt like a "co-creator" of B1 and it filled me with a strange confidence that I might otherwise not have possessed. And of course it also made it possible for me to re-use the module, which I did many times. I played the heck out of it. The dungeon itself is pretty straightforward, with a handful of memorable locations, such as the room of pools and a garden of giant fungi, that made strong impressions on me as a young man. Some of the descriptions are absolutely priceless, such as this from the chamber of Rogahn's girlfriend: "A small tapestry measuring 3' x 4' hangs on the east wall. It depicts a handsome and robust warrior carrying off a beautiful maiden in a rescue scene set in a burning village, with a horde of ominous-looking enemies viewing from afar. Embroidered in gold cloth at the top of the scene are the words, 'Melissa, the most dearly won and greatest of all my treasures.'" That Rogahn sure was smooth, wasn't he? The descriptions gave me good models for how to describe rooms of my own invention, as I eventually did when I had an additional level to Quasqueton later on. That's what B1 was all about: good modeling. The module is also noteworthy for having an extensive list of pregenerated characters in the book, all of them with names. And what names! Tassit, Servant of St. Cuthbert. Kracky the Hooded One. Mohag the Wanderer. Sho-Rembo. Ralt Gaither. Glom the Mighty. Luven Lightfinger. Feggener the Quick. They were all terrific and many of them became PCs, if only briefly, in my earliest adventures. When a character died -- and die they did -- I could just ask a player to pick one of the remaining pregens and we were ready to go again in five or ten minutes, after they'd bought equipment. The back of the module also contained expanded rules for finding and employing hirelings, which could be used in conjunction with the pregenerated characters. All things considered, In Search of the Unknown succeeded in its goals: it taught me how to make my own dungeons. Interestingly, the original version of module B3, Palace of the Silver Princess, followed the same model as B1, since it had lots rooms whose occupants and treasure were intended to be added by the individual referee. The published version of the module follows a more "conventional" format and, I think, suffers for it. I can't recall any other published modules that take the approach of B1 and I think that's a shame. While I'm sure some refinements could be made to its approach, the overall formula is a sound one and could go a long way toward teaching the fundamentals of dungeon design to a new generation of gamers. Perhaps I have another project to add to my ever-growing list. Thanks to the OD&D message boards, I came across the website of William C. Dear, the private investigator hired to look into the disappearance of Michigan State University student James Dallas Egbert III in 1979. The website is surprisingly spare and unimpressive for this day and age, but I suspect Dear gets by on his reputation for being involved in high-profile investigations. I remember the Egbert case quite clearly, because my father was following the story in the newspapers and magazines at the time. His interest in the story was what got my mother to buy a copy of the Holmes Basic Set, believing (incorrectly) that Dad would want to see the game for himself. Instead, the game sat in the hall linen closet unopened until Christmas. 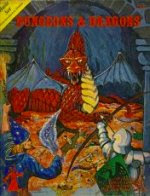 So, strangely, all the negative publicity about D&D turned out to be a catalyst for my becoming involved in the game -- an irony that was probably not lost on TSR, whose sales almost certainly increased due to the notoriety the Egbert case provided, even if they'd much rather have avoided the negative publicity that came with it. Dear wrote a book called The Dungeon Master that chronicles his involvement in the Egbert case and which was published in 1984. I read it many years ago and found it a very odd document, mostly because Dear's experiences playing D&D (in order to understand what James Egbert might have been thinking) were so alien to my own, both then and now. But then roleplaying has always been a hobby whose participants often play the game in wildly divergent ways -- none moreso than D&D. I should see if I can hunt down a copy and read it again. I wonder if I might have a different reaction to it now than I did previously. Consistently cited by Gary Gygax as an inspiration for Dungeons & Dragons, L. Sprague de Camp and Fletcher Pratt's "Harold Shea" series is largely unknown to most gamers today. It's a pity, because these tales are a great antidote to that kind of fastidiousness that says the modern day (or science fiction) and fantasy should never mix. I'm not sure the stories are still in print, but they were a few years ago, so it's worth seeking them out, if only to read some of the stories that influenced Gygax in his creation of the game. Ah, Boredflak, my old friend. How I have missed you and your Foster Grants. They sure don't make 'em like you anymore. Your foreword calls Supplement IV "the last D&D supplement." In a certain sense, you were correct in saying this as there were no more OD&D -- back then, just D&D -- supplements in the offing, but it wasn't the end of "official" game material from TSR. What happened between the time you wrote this in 1976 and the appearance of the Monster Manual a year later? Since meeting, and becoming fast friends with, Frank Mentzer, I have come to see that he and I shared a position at TSR that was unique; that of Gary’s sounding board, idea-bouncer, collaborator, consultant and friendly goad. We talked D&D nearly every day; bouncing ideas off of each other and examining the rules system as it existed at that time. From the time we were working on Eldritch Wizardry, and preparing for Gods, Demi-Gods & Heroes, we knew that we were no longer just adding new stuff but also refining old stuff and changing things a little bit here and there. It was getting pretty confusing, and we had to do something about it. We also had other concerns, chief of which was how to conduct fair tournaments. Before the term came into vogue, we were marketing TSR virally; I was a perfect example. I played the game at a con, bought one and took it back to my group and infected them. As the nature of the game dictated, it was meant to be only loosely bound by the rules as printed; they were originally meant as suggestions and guidelines. Finding 30 DMs to run a tourney for us was a big task in and of itself; finding 30 that played the game the same was impossible as each one ran his own campaigns as he saw fit. Gary Gygax thanks you in both the AD&D Players Handbook and Dungeon Masters Guide. What role did you play in the development of these two books or indeed the entire AD&D project? Continuing in the same vein as the answer to the previous question, we constantly bounced ideas off of each other. There came a time when we started to list all of the revisions and contradictions. We had other problems to address: level and gold piece inflation being two of them, as well as a too-steep learning curve. In the early days, we sold our game to college age buyers, bright high schoolers and the occasional socially challenged older gamer. As bright as they were in general, many of them had complained of the steep learning curve and seeming contradictions in subsequent supplements. No matter how much I tried to drum home the idea that these were suggestions, examples and guidelines in the Forewords that I wrote in each, people wanted to see them as new rules. And, we were starting to hear from parents that had bought the game as a result of their child’s cajolery, badgering or whining, only to find that it was too complex for their precious darlings to jump right in. On that point, I can certainly testify; had I not confidently announced that my club was going to have a go at this new game I was so enraptured with, I might not have spent three weeks trying to grasp enough of it to begin. And I had the benefit of having played it twice. All of these things Gary and I talked about, and more. It was decided to consult with someone with some background in child psych, and J. Eric Holmes came into the picture. So Holmes was brought in because of his background in child psychology? What was the rationale behind this? I can only say this, and it is all secondhand, what Gary told me, what I picked up, etc., as I was NOT part of this. Holmes was brought in to try to enable us to get a handle on a number of different things. Since I got my M. Ed., I understand much more of the rationale behind it. We needed to know such things as : What's too scary for young (9 to 14) kids to handle? We didn't want to cause nightmares. How complex can the rules be for that age to enjoy playing? How do we write "how-to-play" rules for players that young? We were dealing with the problem of the present rules being pretty complex and mystifying to kids a lot older. What kinds of magic were too complex for younger players, or less experienced. We had come to the point that we knew our new market would not be well read in Fantasy, and would be starting out at a disadvantage compared to the earlier adherents of the game. We needed to know how to overcome that. One Thursday, Gary told me to wrap up whatever I had going on at the moment and free up my days starting on the next Monday. Intrigued, I said sure. When I came in on Monday morning, Gary asked me into his office (we were still in the old grey house and had offices next to each other), then told whoever was answering the phone that neither of us was to be disturbed for anything but the direst emergency, or a call from our wives. He had about six sets of the small books and had put up several extra cork bulletin boards in office. For the next eight or nine days, we re-made D&D. We tinkered with various bits and pieces, changing and tweaking damages from various weapons and spells (Magic Missile comes to mind). 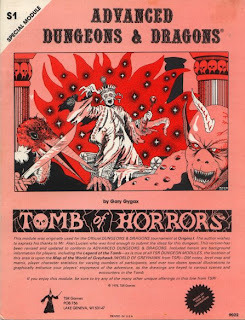 At the end of that period of time, we had two files of papers and cut-up booklets; one was Basic, the other AD&D. Much less was left to interpretation; more was spelled out in charts and tables. We were looking at tourneys. We must have rolled several hundred different confrontations while we tinkered with HP and DAM. We cut up those books and stuck stuff all over the walls. From that came Basic D&D and Advanced D&D. I was like the midwife at the birth. Tim Kask, TSR's first Publications Editor, has graciously consented to my asking him a few questions about the history of his involvement with the roleplaying hobby and the role he played in the early days of Dungeons & Dragons. Because many of Mr Kask's replies were lengthy, I have broken up his responses into multiple entries that I will post over the course of several days. I hope everyone will enjoy the details and insights these questions bring to light and I'd like to thank Mr Kask once more for his allowing me to interview him. It's my hope that this interview will be the first of series with individuals associated with the early days of the hobby. You note in the foreword to Gods, Demigods, & Heroes that your first assignment for TSR was Supplement II: Blackmoor. How did you come to be hired by the company and what was the extent of your duties as its "Publications Editor?" This is going to be a long answer because you have asked for a lot of background in just a few words. I first met Gary over the phone in late ’73 or early ’74, when I was a married student with a daughter at Southern Illinois University in Carbondale. This came about because I called Directory Assistance (called Information back then) and asked for his number. I had seen the address of Lake Geneva in the back of the Chainmail rules, which were what I was calling him about. To be perfectly honest, I do not remember exactly what about. In any event, the phone was answered by a perfectly polite and friendly gent that did not seem in the least put out by having a stranger call him at home at night. (It was probably a Friday evening, after 9 PM when weekend discounts on Long Distance applied.) We must have talked for at least an hour, and we seemed to hit it off right away. I called a couple more times during the next several months, mostly talking about miniatures and miniatures rules, but also straying into many other areas, including my recent service in the USN in ‘Nam. Somewhere during the fall and winter of ’73-’74, Gary first mentioned this new game concept he was first working on, then published. He invited/challenged me to come to his game convention in August in Lake Geneva sometime in late May or early June. I worked it out to go up to the Quad Cities (where my wife and I grew up and had family), drop off my family and head up to LG. I was very naïve about GenCon, figuring I’d just find a motel somewhere not too far away and check it out. Condensed Version of the First GenCon. I drove up and we met face-to-face. I entered two miniatures tourneys and won them both. Somebody walked down the hall, at the Horticultural Hall where the con was held, calling out for a few players to come join in an “adventure” in that new game Gary had been talking about. (I am not sure, but I think that it was Rob Kuntz, who was just a kid then, while I was 25.) Remembering what Gary had gone on and on about, I signed up. A couple of minutes later, I signed up for another adventure, this time as a dwarf. The condensed version of that was that I rescued a dying dwarf king with no heir, was granted the dwarf kingdom and given the Royal Seal. Then it was time to quit playing! I bought the old brown box set and a set of dice, talked to Gary a bit more where he told me to stay in touch and keep him informed of how it went with my game club when I introduced them to D&D, and headed back to my family. Gary and I had a private conversation where he told me of his plans to some degree and said that when I graduated next summer, there might well be job he could offer a good editor. When I got back to my game club, I announced that I had played in this really strange great game, and they were all going to have a chance to play real soon. Real soon stretched into about three weeks; I had no idea reading and understanding those three little books would be so tough. Had I not played, however poorly, I would not have had a clue. I whipped up some dungeon levels, we rolled some characters up that fateful Sat. morning, and my first campaign was under way. About once a month I would call Gary up and we would talk at length about what my group was doing, had done and how we had done it. We talked about lots of other things as well, and discovered we had even more in common than we had known. We both liked several of the same fantasy authors, had similar tastes in military history and even liked a lot of the same movies. After a couple of months of playing, about Christmas break, I announced that when they all came back after the holiday we would be generating new characters (using an average die for starting levels to recognize the fact that they were not complete greenhorns) and playing in a new campaign setting. I had gotten a copy of Greyhawk by then and wanted to incorporate some of it Thus was born my Ruins of Kwalishar campaign. [That name ought to sound familiar! -JM] I wrote out an elaborate basis for the campaign, and we never looked back until I graduated in Aug. of ’75. 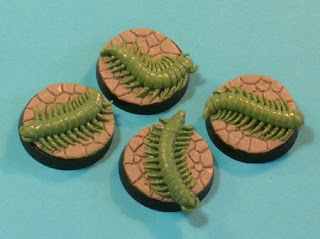 My monthly chats with Gary continued and I started tinkering with things as per Gary’s instructions and letting him know how it had worked out, what my players thought, etc. (It was only later that I realized that we had been play-testing for Gary.) I then went to GenCon ’75, met Brian Blume and made plans to move there in a month, which my family and I did. I was hired by Tactical Studies Rules, which a few weeks later was supplanted by TSR Hobbies, Inc.; I was the first full-time employee of both. As for the rest of what I did, I edited the rest of the stuff we did. I took over The Strategic Review with issue #5, and our plans to eventually produce a real magazine began to take shape. I edited game manuscripts. But where I really began to learn my craft was with Blackmoor, the second D&D supplement. Dropping the basket at my feet, they announced that it contained the next supplement and that I should pitch right in. After stirring it a bit, I asked if they were serious, and they assured me that they were. It took the better part of two days to sort it out, and another day or two to try to make some sense of it. When I reported back about a week later that what I had found was contradictory, confusing, incomplete, partially incomprehensible, lacking huge bits and pieces and mostly gibberish, they laughed and said they knew that. Both of them had already come to the same conclusion that if I was to be the editor, here was my acid test, and that neither one of them certainly wanted to do it. So over the next several weeks, I sorted, filled in, added and deleted. What came out was about 60% my work, 30% Dave Arneson’s and the remainder came from Gary and Rob Kuntz. I was reminded by Gary that the day I brought the finished manuscript in to him and Brian that I threatened to quit if ever I was given another “project” (read “basket case”) such as this one. For the next couple of years that what I did; edit the supplements, edit TSR, edit The Dragon and Little Wars after we spun them off out of TSR, proofread virtually everything we did, continue to be Gary’s editor, and all of my other TSR duties as well. Thanks to Steve Tompkins at The Cimmerian, I learned a wonderful new word today: "Brundage-bait." I'm in the midst of putting together an interview with Tim Kask, former TSR Publications Editor, and, in doing so, I have learned more than a few things I'd never anywhere else. One of them relates to just why J. Eric Holmes was selected to edit the Basic Rules that are now so indelibly associated with his name. With luck, the answer to that question and some additional insights into the early days of the hobby will be revealed in the next day or so. Stay tuned! 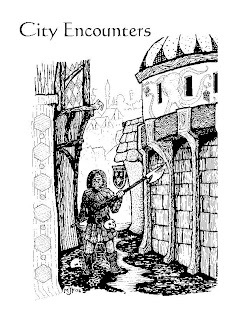 As I've mentioned on many occasions, I began playing D&D in late 1979 with the Basic Set edited by J. Eric Holmes rather than either OD&D, like some of my older contemporaries, or Moldvay, like most of my younger contemporaries. The Holmes Basic Set was published in 1977 and is kind of a strange bird, being at once a revision and representation of OD&D for the mass market, an introduction to the then-unpublished AD&D game, and a unique game in its own right. While I never played a "pure" Holmes game -- I used a weird mix of Holmes plus AD&D plus house rules/variants I picked up from my friend Mike's metalhead brother -- I still have a lot of fondness for this particular version of D&D. Some of that is simple nostalgia, but some of it is because, having recently reread this 48-page book -- shorter even than Moldvay -- it comes across as the last gasp of pre-fad D&D. That is, it's clearly a product written for people already involved in the wargames/early RPG hobby rather than a true mass market product in the way that Moldvay's revision is. This should come as no surprise, since Holmes was heavily involved in the early fanzine communities that helped propel D&D to the heights of success it would later enjoy. This version of the game is clearer and better written than the little brown books, but I guess what I'm saying is that, despite that, it feels much more continuous with the LBBs than does even AD&D, never mind Moldvay or Mentzer. I think that continuity is often discounted much too readily by people who don't share or even understand its attraction. 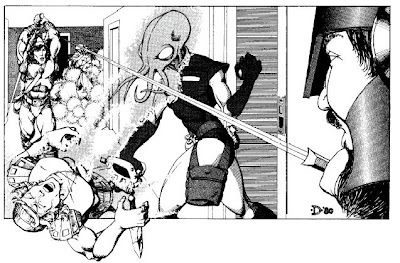 One of the things that's drawn me back so powerfully to OD&D and its spin-offs is that continuity. I'm not a first generation gamer; I didn't play OD&D and I wasn't a wargamer. But I knew a lot of people who were and who were involved, sometimes heavily, in the fan communities that sprang up at the dawn of the hobby. They'll always be my spiritual "big brothers," who initiated me into this pastime and showed me the ropes of how to be a referee. I'm forever grateful to them for that and games like the Holmes edition still speak to me of that period just before I got involved in gaming. Even if I didn't prefer the style of play these games espouse -- though I do -- I feel an obligation to honor those who came before and laid the foundation for the nearly 30 years of fun I've had playing D&D. Holmes Basic is far from perfect, either as an introductory game or as a vehicle for keeping alive the spirit of OD&D. Nevertheless, I find it a good first attempt at a "Basic OD&D" and can't help but think that the retro-clone we're currently missing is something more in line with Holmes, a kind of half-step between the Wild West of OD&D and the mass marketization of Moldvay. There's a big part of me that thinks such a halfstep might, in fact, be the perfect intro RPG, one that marries the "imagine the hell out of it" philosophy of the old days with the better graphic design and presentation of contemporary game publishing. I find myself thinking about such things a lot these days, so perhaps it's another project to add to my pile.